Nike introduced in February a renewed model of its Fuelband bracelet, with more colors than before and some extra features. The Fuelband is a smart wristband that records our daily activity, the number of steps we take, the distance traveled, calories burned, etc. The bracelet connects with the PC or Mac using Nike + Connect, and with this software we can synchronize the data between the bracelet and the PC and customize its configuration, such as defining our daily goal. 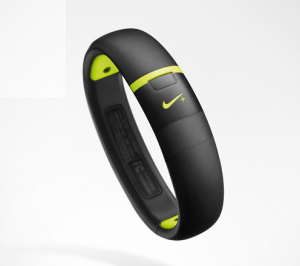 Nike Fuelband, like other Nike quantifiers, uses its own system measurement for the exercise, the NikeFuel. It is a way of measuring any type of physical activity and is based on the movement of the whole body. Thus, we can not only use the bracelet for running, but also for other sports such as tennis, cycling, swimming, etc. The bracelet includes Bluetooth, and in addition to connect with our PC or Mac, it can also connect to a mobile device using the app Nike + Fuelband. This app is only available for iOS devices and it can be downloaded for free from the App Store. Nike + Fuelband is a utility that supplies all kinds of statistics about our physic activity. We’ll have all the information right away and we can use it to configure the bracelet, change the daily goals and share our progress and achievements on the social networks. The Fuelband SE, like the previous model, is available in three sizes, S, M/L and XL, and we can choose between yellow, pink, red and black. Nike also has a version in pink gold and silver, more expensive, which give a more elegant touch. The price ranges from $149 (standard) and $169 (silver or rose gold). You can buy them in the Nike store.